What with the overwhelming amount of content designed to catch the eyes of youngsters everywhere, it'll be interesting to see what kind of nostalgia for cartoons of their youth kids today will have 30 years from now. 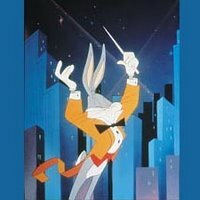 Last Saturday, part of my birthday weekend surprise was a trip to the Tennessee Performing Arts Center to see "Bugs Bunny on Broadway," an exploration of the classical music used in the Warner Bros. cartoons of the '40s and '50s, delivered via the Nashville Symphony Orchestra. The excerpts from "Baton Bunny," "What's Opera, Doc?" and "The Rabbit of Seville" all brought back memories from Saturday mornings propped up in front of the TV, cereal bowl nearby, absorbing these great comic and musical moments. That merging of the "high culture" of classical music with the "low culture" of cartoons showcased the genius of animation directors like Chuck Jones and Friz Freleng, not to mention the vocal mastery of Mel Blanc, in a way that the animation of today simply can't match. Why? Well, mainly because the cartoons of today are 30-minute infomercials for video games and action figures, not short films designed to appeal to a broad audience. No commercially conscious animation studio today would think of creating something as sublime as "High Note," a trip through "The Blue Danube" starring a sodden quarter note as the protagonist to a frustrated conductor, also played by a quarter note. Kinda hard to pump out a series of plush toys and candy based on this cartoon, but the execution is brilliant. Yes, there were some flaws in the Looney Tunes universe, some societal directions that haven't aged well in the intervening decades, but from a creativity standpoint, very few of today's cartoons can hold a candle to those simply drawn worlds of days gone by.